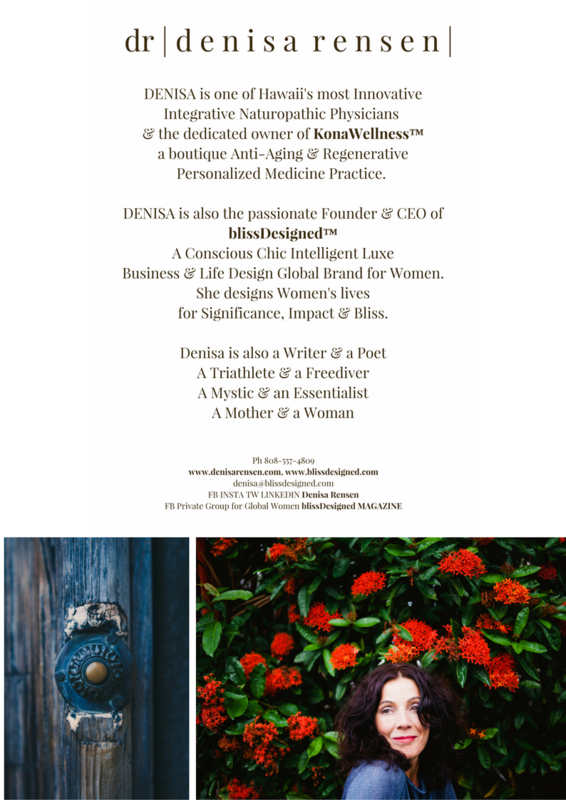 I am Dr. Denisa Rensen and I am passionate about Quality Life-Design & Superlongevity. I am here to support you, as you design your health, your life for SIGNIFICANCE, for IMPACT & for BLISS. I offer gentle, evidence-based and innovative medical solutions for women’s hormones, cognitive function & mood, cardiovascular, neurological & metabolic conditions, allergies & rheumatological conditions (LDA/LDI), medically supervised weightloss, hCG, sports and exercise nutrition, IV nutrient & chelation therapy, Platelet Enriched Plasma PRP for Pain & Injury Repair and for Aesthetic Rejuvenation. Women's medicine should be regenerative & beautiful. That is why I designed a boutique blissDesigned Medicine Series, a comprehensive treatment protocol that allows for quality time for connection & genuine collaboration. "Wherever there is a love of medicine, there is a love of humanity"